alaTest has collected and analyzed 3 reviews of Leviton Decora Smart Dimmer. The average rating for this product is 3.1/5, compared to an average rating of 4.7/5 for other products in the same category for all reviews. We analyzed user and expert ratings, product age and more factors. Compared to other products in the same category the Leviton Decora Smart Dimmer is awarded an overall alaScore™ of 83/100 = Very good quality. 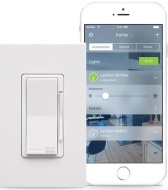 Check out this switch by Leviton that connects with Apple's HomeKit. The physical controls are stiff and awkward and it can only work with HomeKit. Sorry, Android, Google Home and Alexa users. The design is also plain. The switch works well and it's easy to get running, but the clunky physical controls, lack of compatibility outside Apple and plain design prevent it from being a really great product. Added support for Nest and IFTTT brings Leviton's Wi-Fi-based smart products closer to a buy rating.